KITsubs: Kamen Rider episode 33! In this week's episode, Shocker has a visitor from Brazil. He stopped by to catch up, get some much needed rest, check out the local attractions... and blow up all of Japan's gas tanks. Sure, why not! And while he's there, he figures he might as well finish that little project he started a while back: Brutally murdering an entire family! Anyway, his plans get cut short when a little turbulence comes his way, in the form of a few Rider Kicks. How is a multicolored Armadillo-about-town supposed to relax like this?! There is some top notch directing and action choreography in this episode. The plot... eh. Let's just assume it was sacrificed in order for that awesome final battle on the bridge to happen. And coming to you from one of our favorite fans, whom we are a fan of, and he himself is also a fan of voice actors: Jeff Burns trivia time! This week has an interesting voice actor portraying Armadilong, Michihiro Ikemizu. We've heard him before as Zanbronze, Scorpion Man and Hitodenja and will continue to hear him more throughout the series up to Super-1. 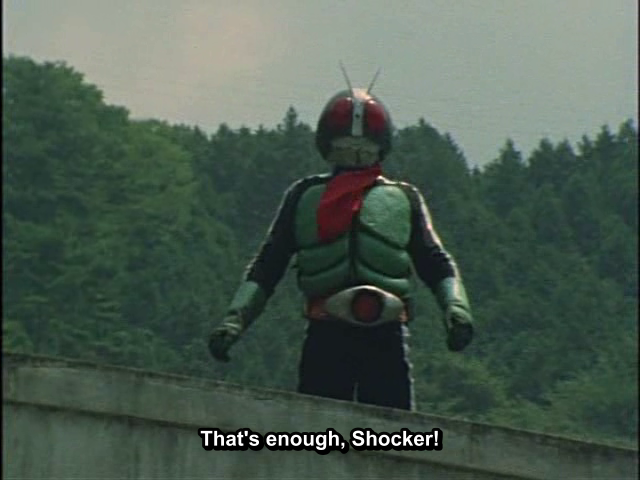 The interesting part is that years later he will go on to be one of the many voice doubles of Kamen Rider 1 and he can heard several times in Skyrider (and also Kamen Rider Stronger when Shigeru Araki was unavailable during his initial appearance). Other Toku Credits (as listed on wikipedia) include Fireman, Jumborg Ace, Chojin Bibyun, Barom-1, Battle Hawk and Ultraman Ace (filling in as UltraSeven). Another well known Toku related role he played is Moonlight Mask in the 1973 Anime adaption. Awesome stuff, as always. You know how much we love trivia here! Anyway, sorry for the delays lately. Like I've mentioned a few times elsewhere, I'm working on a side project with a few friends from some other groups. It's not a tokusatsu series, and for various obfuscated reasons that even I don't understand, I'd like to keep it kind-of-a-secret on here. Anyway, that project is a weekly. So it takes up a lot of my time, and it's released on a time scale I'm not quite used to yet. The good news is that it's teaching me a lot more about the technical aspects of subbing, and getting me much more comfortable with editing our already-amazingly-translated scripts. And as we release more episodes, I'll get more comfortable with doing more than one release a week. And with that said, I'm going to try to make sure that episode 34 comes out a lot faster than this one did. So we hope to see you again, soon! I know that Brazil does have a pretty big Japanese population, so that was pretty cool to see reflected here. 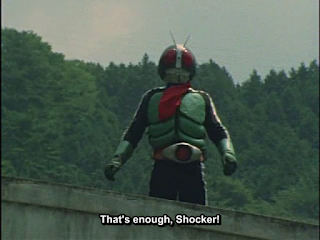 @Igadevil: That would explain why there are so many Brazilian transplants in anime and tokusatsu! @GomessQ: Thanks? As much as I would love to get these done once a week right now, we just can't. Between the amount of work that we're all doing on other projects and our day to day lives. But we're definitely trying, and once the side project is finished (which is a weekly) we should be back to business as usual. But even until then, once every week and a half/every other week isn't that bad. Some shows take much longer to release. And in my opinion, less than a year and a half to finish a third of the series is pretty good speed. Thanks for your many continued and tireless efforts! By the way, the guest star of the week was played by ballet dancer, Mieko Saegusa. The name of her character should be rendered as "Connie Yamada". Saegusa also appeared as the human form of Kittyfire in the second episode of Tsuburaya Production's MIRRORMAN (1971). From Episode 4-26, she played "Michi", Mr. K's Secretary and Female Commandant Liaison in Toho's RAINBOWMAN (1972).